We know that animals have found ways to get themselves drunk or high by eating certain plants or fermented fruit, but recently, scientists have started studying the self-medication of animals — a branch of science dubbed zoopharmacognosy. This is how we discovered elephants might have a way to bring on labor. Researcher H. T. Dublin spent a year observing a group of elephants. She charted their regular diet, and the paths they walked to find food. One day, a female elephant went off on her own. Heavily pregnant, she still walked for miles until she got to a tree that Dublin hadn't seen any elephant eat before. The elephant chomped the tree until nothing was left but a stump, and the next day went back to her normal feeding pattern. Four days later, the elephant delivered a healthy calf. Dublin thought the behavior was notable, but didn't put too much emphasis on it. Even though elephant pregnancy lasts about 22 months, the fact that there were four days between the elephant eating the tree and delivering the calf made the connection between them seem weak. Still, when Dublin asked about the plant, she found that Kenyan women sometimes used it to bring on labor, or to induce abortion. The plant, boraginaceae, is a relative of borage, which was also used by women near the Mediterranean to induce labor. Humans in many parts of the world use the plant, or its near relatives, to bring on labor. This sighting indicates that elephants might be using it for exactly the same purpose. If the elephants are using it, the question is how they got their medical knowledge. Elephants are a matriarchal society in which older females teach younger ones how to survive, how to find food, and where to find water. It's possible that medical knowledge is also passed from older to younger generations. It's also possible that the behavior is instinctive. 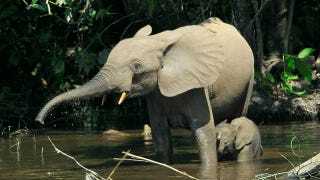 When an elephant is late in her pregnancy, she might crave that plant the way humans crave calorie-rich food or vitamin-rich food when they're starving.